MMA fans who also are warriors for animals must have been torn the other night, watching Washington DC’s first UFC event where long-time vegan Mac Danzig sought to avenge an a controversial loss against “Handsome” Matt Wiman, who has been sporting “MeatyourMeat.com” and “FoodIncMovie.com” on his fight shorts. 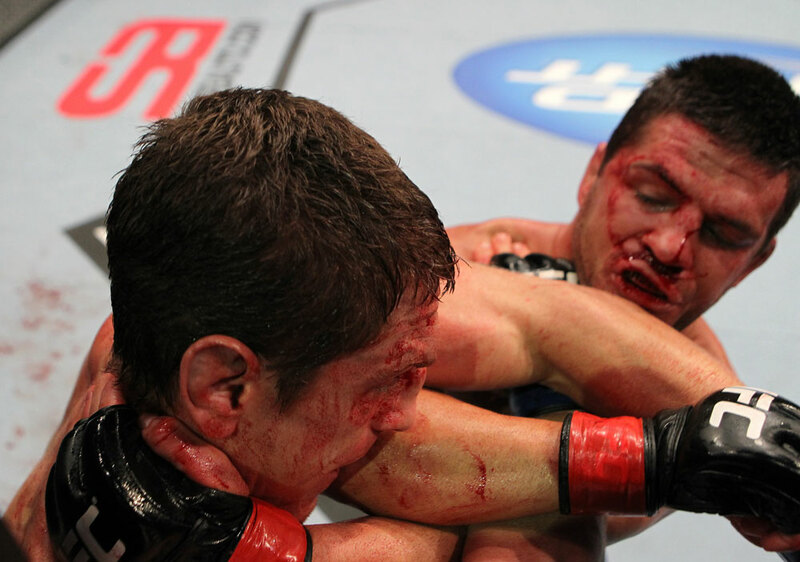 According to UFC.com: "There was no abbreviated ending in the rematch between lightweights Matt Wiman and Mac Danzig. Instead, fans got 15 full minutes of action – with the emphasis on action – from the two Ultimate Fighter alums, with Wiman pulling out a close, but unanimous, decision win. See post-fight interview". While Wiman ultimately took the win by decision, both fighters got a much-deserved $65,000 “Fight of the Night” bonus, the crowd-pleasing Danzig’s second, in addition to his “Knockout of the Night” award in his last fight against Joe Stephenson. Check out Danzig's new website and give him a shout-out on twitter! Even post-fight, looks like these guys are still pals. Only one question remains, can we send them both into the offices of Trophy Hunter Magazine?